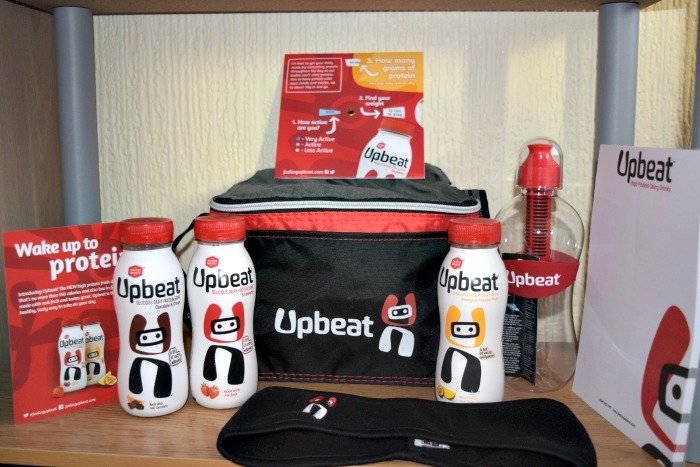 Today I have a great competition prize up for grabs from Upbeat. 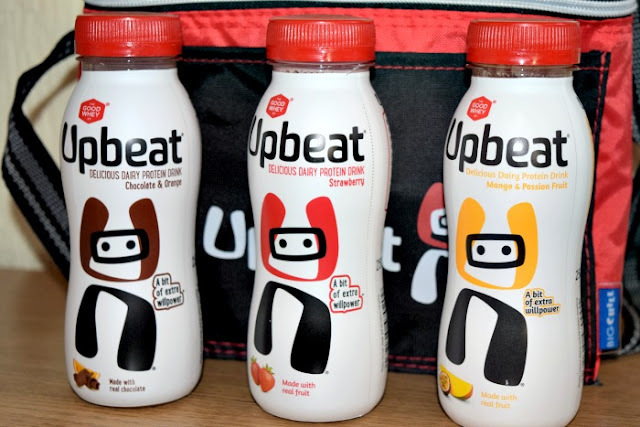 Upbeat is a delicious dairy protein drink. With half the sugar of most fruit smoothies it is high in protein and low in fat with no more than 150 calories in each bottle. It comes in four different flavours; Strawberry, Blueberry & Raspberry, Mango & Passionfruit and Chocolate & Orange. Great for those dieting or enjoying a healthy eating lifestyle who fancy a smoothie/shake without the high sugar content. A guilt free treat that slowly releases energy, my favourite flavour out of the four was definitely Blueberry & Raspberry with Strawberry close behind whereas Gracie loved the new Chocolate Orange flavour which I wasn't so keen on. They are very smooth tasting more like a fruity milkshake than a smoothie. It is a great way to help increase protein in your diet especially for fussy eaters. Upbeat is currently available to buy in the chilled aisle in Tesco and will hopefully be available in more stores soon! Upbeat kindly sent me the goodies above (vouchers for the drinks so I could choose my own flavours) and they want to give a selection of goodies to one of you lucky readers too! To enter all you need to do is follow the instructions on the Rafflecopter form below. Don't forget if you are commenting using the anonymous selection to add your name with your comment so I know it is you! Open to UK only. The competition will end 18/07/2015 at 12am. All entrants must complete the mandatory entry on the rafflecopter form. Those who don't will have all entries removed. The blog owner will choose the winner through the rafflecopter form (which uses random.org) The winner will be notified by email and displayed on the widget. One winner will receive a selection of Upbeat goodies (may vary slightly from items pictured). No alternative prize will be offered. Allow up to 28 days for delivery. I received the items featured free of charge for the purpose of this post. All opinions are my own. I would love to create a peanut butter flavour. The Chocolate Orange flavour sounds lush! The chocolate and orange flavour sounds interesting - I would try it first. I'd love to try the banana one. I'd love to try the chocolate and if I could create a flavour, I'd create pecan and maple flavour! I'd create White Chocolate and Raspberry! There should be a chocolate peanut butter flavour! Not everyone likes orange and chocolate, eww. Mango and Passion fruit for me. I'd like a smores protein drink. Sweet tooth all around! Chocolate Orange sounds so tasty! The mango and passionfruit looks great! strawberry would be a great flavour could also try mixing with other fruit in a blender to make a super protein smoothie! Mango and passion fruit, have tried the strawberry and chocolate but not seen this one. Mango and passionfruit sounds lovely! I love upbeat, mango and passionfruit, yum! Strawberry for me I think! I would love to ry the chocolate orange.